The Artglace managing committee – Confédération des Associations des Artisans Glaciers de la Communauté Européenne – decided the guide lines for the 2 nd European Artisan Gelato Day. The flavor of 2014 will be: “STRACCIATELLA D’EUROPA”, milk based gelato with chocolate and orange juice. “Stracciatella” has been chosen in memory of the gelato artisan Enrico Panattoni (that died last October 2013), who owns the paternity of this flavor. It is said that in a night of 1953, blending the freshness and the delicacy of the cream with the strong taste of the dark chocolate, he created one of the most still loved and appreciated flavours. The price of each sampling will be decided by each nation participating the Day, but the national President of Artglace will report it to the Meeting called at Sigep – International Exhibition of Gelato in Rimini on Monday, 20 th of January 2014, at 2.30 pm, at “Ciliegio” Room (South Hall). Furthermore, all the events of the 2 nd European Artisan Gelato Day will be timetabled: every country will communicate its own programs, that will be inserted and published in the Artglace website, “News” area. They will receive the highest possible visibility thanks to the press notes and the communications on the social networks (European Gelato Day /Facebook). During Sigep – International Exhibition of Gelato in Rimini, the disks with all the typographic material to be reproduced (decals, posters, flyers in the different languages…) will be given to each gelato artisans Association of the nations participating in Artglace. At the stall G.A (South Hall) at Sigep, it will be possible to book/buy the kit for the 2 nd European Artisan Gelato Day, that will include cups (mis. 16/b) and spoons (made with 100% biodegradable and compostable materials), posters and flyers like done for the 1st edition in 2013. 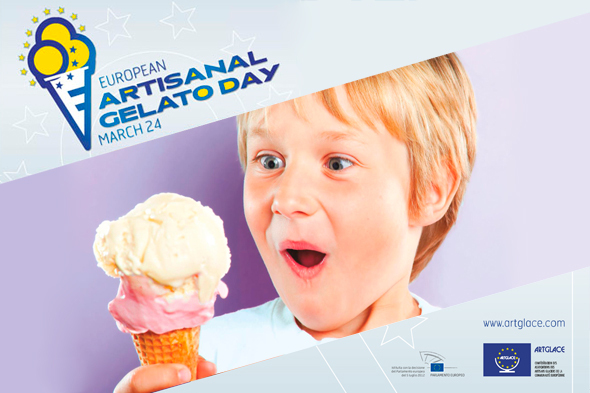 All the gelato shops participating to the 24 th of March 2014 event will be inserted on AppGelato, that the company Cosmobile Srl gives for free until the 30 th of June 2014. For any other information please call: Artglace, +39 331 9043490, or email at info@artglace.com. February 3, 2014 | Filed under Uncategorized @en.